Software: VisualrotaX helps you create and run your shift pattern effortlessly. Training: We hold courses in workload analysis, operational research, creating, managing and introducing a shift pattern. 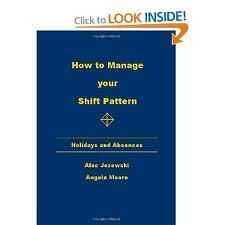 Shift Working: Assess your current shift pattern, create a new shift pattern and implementation. For any organisation using shifts regardless of size and complexity you need easy-to-use and reliable software to organise them. VisualrotaX software is for creating and running an efficient shift pattern. It is run in Excel and stacked with features to make running your shift pattern effortless. We organise training courses in creating, running and implementing shift patterns. These courses are designed to give you the knowledge to manage your shift pattern to ensure that you have the right people in the right place at the right time. Business Health Check is all about ensuring you are using the best shift pattern to meet your current operational requirements. As part of this service we will assess your current operational needs, and then compare this with your current shift pattern. We will then evaluate the shift pattern and recommend any improvements. If the current shift pattern is not fit for purpose then we will suggest an alternative shift pattern and an evaluation of how the new shift pattern will fit into your business.